The ROTSE III robotic optical telescope on the H.E.S.S. site. ROTSE is a network of four 45 cm robotic, automated telescopes built for fast optical follow-up measurements in response to gamma ray burst triggers from satellites. The telescopes have a wide (2 degr.) field of view and a 2048 x 2048 CCD. For details, see Akerlof et al. 2003. Part time, the ROTSE telescope is used by the H.E.S.S. collaboration for monitoring of active galaxies and other variable objects, such as the Bl Lac object H2356-309. The investigation of very high energy (VHE) gamma ray emission from active galaxies serves multiple goals: on the one hand, one wants to understand the high-energy processes in the jets emitted by the supermassive black holes at the cores of active galaxies, on the other hand they serve as cosmological probes, for example to measure the amount of extragalactic background light (see Dec. 2005 SOM). The object H2356-309 (within H.E.S.S. also known as "Hugo") is VHE gamma-ray emitting object recently discovered by H.E.S.S., at a relatively (for VHE gamma sources) high redshift of z=0.165 (Falomo et al. 1991). 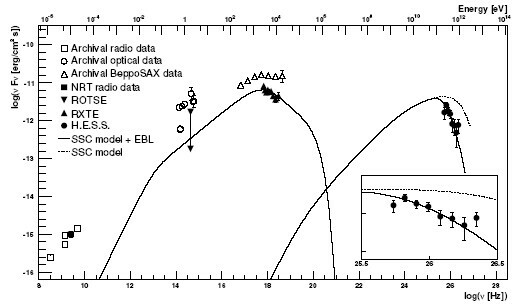 It was suggested as a target for observations on the basis of its high radio and X-ray flux (see Fig. 1 of Dec. 2005) and, together with the even more distant object 1ES 1101-232, has provided interesting constraints on the level of the extragalactic background light. VHE gamma-ray data alone are not sufficient for decisive tests of models of gamma ray emission from active galactic nuclei and to determine the model parameters; knowledge about these systems is limited and the number of degrees of freedom in the models is too large. High emphasis is therefore placed on multiwavelength studies, where emission is measured across the entire electromagentic spectrum. Particularly interesting are observations during flares, where one can see the temporal correlation between flux variations in different wavelength regimes. Such a multi-wavelength campaign was carried out for H2356-309 in the second half of 2004, including the RXTEX-ray satellite, the ROTSE III optical telescope located on the H.E.S.S. site (see above) and the Nancay decametric radio telescope (Fig. 1, see also here). 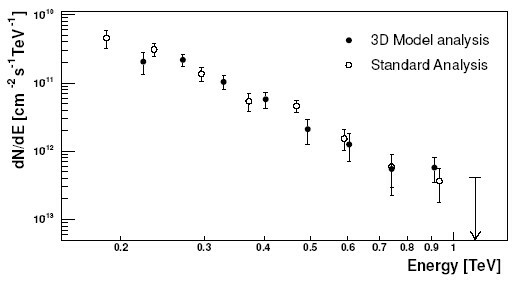 The Bl Lac object H2356-309 was detected with more than 10 sigma significance; its energy spectrum is consistent with a power law with spectral index 3.1 (Fig. 2). The wide-band spectral energy distribution resulting from this campaign is shown in Fig. 3, together with a fit of a SSC model (e.g.Katarzynski et al. 2001), where the radiating particles are electrons. The energy output rises from the radio through the optical range, and reaches a peak between the optical and X-ray regimes. Level and shape of the VHE gamma ray spectrum suggests a second peak just below the H.E.S.S. energy range. In the model, the first peak is attributed to synchrotron emission, the second to synchrotron photons upscattered in energy by the electrons. Data are reproduced if one assumes that the jet emerging from the black hole is highly relativistic, with a Doppler factor around 20. Fig. 1: The Nancay decametric radio telescope, see also here, was used to monitor H2356-309 in parallel with the H.E.S.S. gamma ray observations. Fig. 2: Energy spectrum measured for H2356-309. Open and closed symbols illustrate results obtained with two completely independent procedures for data calibration and analysis, illustrating one of the many checks routinely carried out for H.E.S.S. results. Fig. 3: Wide-band spectral energy distribution for H2356-309. The quantity shown is proportional to the amount of energy emitted in each decade of the electromagnetic spectrum. Full symbols represent simultaneous observations by H.E.S.S., RXTE, ROTSE and the Nancay radio telescope; open symbols give archival data. The line shows the spectrum obtained by an SSC model; the low-energy bump is synchrotron radiation by electrons, the high-energy bump represents "inverse Compton" upscattering of synchrotron photons by electrons. The model underpredicts the radio emission, where other regions of the jets contribute in addition.